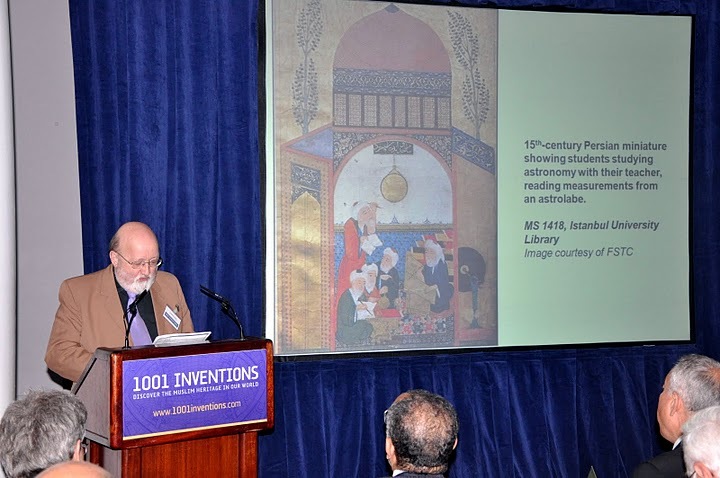 [Proceedings of the conference 1001 Inventions: Muslim Heritage in Our World organised by FSTC, London, 25-26 May 2010]. The following article presents a brief status about the transmission of Muslim scientific texts, and how the physical means by which it was done may have affected their reception and influence in both the Muslim world and Europe. The article documents in particular the traces of existence of printing in early Islam, several centuries before the invention of printing by Gutenberg in the 15th century. 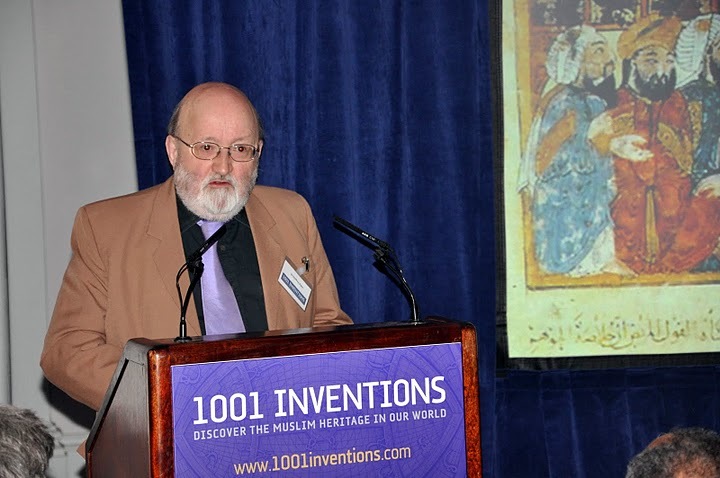 Figure 1-2: Geoffrey Roper presenting his lecture in the "1001 Inventions" conference. © FSTC 2010. In this brief presentation, my aim is to make a few points about the transmission of Muslim scientific texts, and how the physical means by which it was done may have affected their reception and influence in both the Muslim world and Europe. Figure 3: Qazwini, 'Ajaib al-makhluqat, MS probably from Mosul, ca.1305. British Library, MS Or.14140. It is sometimes said that Muslim literary and learned culture was primarily based on oral transmission, with writing used mainly to fix and reinforce texts produced in the context of direct discourse of masters to pupils and fellow scholars . There may be some truth in this as far as religious, legal and literary texts were concerned; but when we consider scientific treatises, it seems less likely to have been the case. The detailed presentation of data, calculations and especially illustrations and diagrams, depends essentially on writing and recording them in a permanent or at least semi-permanent medium. The teaching of scientific subjects must also have normally involved the use of pen and paper, as depicted in some miniature paintings. Figure 4: 15th-century Persian miniature showing students studying astronomy with their teacher, reading measurements from an astrolabe. MS 1418, Istanbul University Library. Image courtesy of FSTC. At first, the ancient materials – papyrus and parchment – were used, but one of the great gifts of the Muslims to learning and science was the introduction and widespread adoption of a new medium, paper . Originating in China, this was a comparatively portable as well as a durable medium, and it soon became widely adopted for all kinds of sacred and secular texts. Many centres of paper production were established throughout the Muslim world, and their techniques were eventually transmitted to Christian Europe. Not only was paper convenient to use, transport, and store, it was, most importantly, considerably cheaper than papyrus and parchment, probably partly because of the use of recycled rags as raw material in its manufacture. Whereas an early Qur'an copy (ma? ?af) on parchment is reckoned to have required the skins of about 300 sheep , an equivalent amount of paper could be produced much more rapidly, in much greater quantities, and at much lower cost. This transformed the economics of book production, and made possible a greatly increased production of manuscript books, on a scale which was unprecedented and unmatched in Europe at that time. Figure 5: Depiction of an Arabic manuscript library. Maqamat of al-Hariri Illustration by Yahyá al-Wasiti, Baghdad 1237, Bibliothèque nationale de France, MS Arabe 5847. Many of these books were assembled in libraries, where scholars could go and consult copies, even if they could not own them . In this way, a whole new book culture was created – in which, incidentally, not only men but women also participated, on a considerable scale, as several historical sources attest . This new ease of book production of course played a crucial role in the creation and transmission of scientific and mathematical texts. The Muslim scientists could carefully record and illustrate their findings and theories, and -- in such fields as medicine, pharmacology and dietetics – their prescriptions and recipes . Further copies could then be made, both by themselves and by other scribes, and these could be made available to contemporary and later researchers and practitioners, who in turn could use them as foundations for further advances in knowledge. Figure 6: The Mongol siege of Mosul from a manuscript of Rashid al-Din's Jami‘ al-Tawarikh, 14th century. But although this amounted to a minor revolution in the means of spreading knowledge, it still had severe limits. The availability of scientific texts remained restricted in most cases to a few dozen copies, and manuscripts were frequently lost through fire, flood, decay and sometimes wanton destruction in war and civil unrest. Some libraries themselves suffered attrition or wholesale destruction . So the consolidation and advance of scientific knowledge remained quite fragile. Figure 7: Table of libraries destroyed. Main source: O. Pinto, "The libraries of the Arabs during the time of the Abbasids" (Tr. F. Krenkow), Islamic Culture, vol. 3 (1929), pp. 234-239. Figure 8: Arabic block-print from Egypt, probably Fatimid period. Gayer-Anderson Museum, Cairo. The major revolution which would ensure the widespread assimilation and preservation of the intellectual achievements of Muslim scientists was yet to come. This was, of course, the introduction of printing, which could allow the immediate production of hundreds and even thousands of accurate copies of texts, together with their illustrations, thereby ensuring both their wide diffusion and their permanent preservation. Printing, like paper, originated in China , but its adoption outside East Asia is usually attributed to Gutenberg in 15th-century Europe. This is quite incorrect: Muslims in Egypt and probably elsewhere were using printing to mass-produce texts as early as the 10th century. Dozens of examples of their output are preserved in museums and libraries, but have, until recently, been overlooked and neglected by scholars . This phenomenon is yet another example of the 1000-year missing history of science and technology. Figure 9: Arabic block-print from Egypt, probably Mamluk period. Gayer-Anderson Museum, Cairo. It is, however, true that Muslims did not use printing to produce books, nor extended texts in any form, until the 18th century. This challenge was taken up by Europeans from the 15th century onwards, and it would not have been possible there, without the availability of another gift from the Muslims, which has already been mentioned: paper, which had earlier reached Europe from the Muslim world, via Spain and Italy . Figure 10: Italian paper-mill, probably from the 16th century. The early output of the European presses included the works of Muslim scientists, such as Ibn Sina ("Avicenna"), Al-Battani ("Albategnius"), Al-Razi "Rhazes" and many others , whose ideas and discoveries were so important in underpinning the intellectual and scientific revolution of the European Renaissance. Many of the more important of them were translated into Latin, and later into European vernaculars, published and distributed throughout European scholarly circles in what came to be known as the "Republic of Letters ." Without the printing press, the impact and effect of this body of knowledge would have been much less. Indeed, some Muslim scientific texts, such as Ibn Sina's Qanun, had been translated earlier, in the mediæval period, but as long as they remained in manuscript only, they did not precipitate a European scientific revolution. Figure 11: [Ibn Sina, Qanun], Latin translation by Gerard of Cremona. Venice: Antonius Junta, 1527. From the 16th century onwards, it was not only translations that were published, but an increasing number of the original Arabic texts themselves. For this purpose, typographers developed the difficult techniques of cutting and casting the letters of the Arabic alphabet as movable types . While the results were not always beautiful, they did enable the growing number of European Arabic scholars to gain access to these original texts of the Muslim scientific heritage. Figure 12: Ibn Sina, Kitab al-Qanun fi al-tibb, Rome: Medici Press, 1593. Meanwhile, in the Muslim world itself, manuscripts remained in normal use. Because scribal culture was more pervasive and better established there than it had ever been in Christian Europe, Muslims were more comfortable with it, and saw no immediate need to adopt printing presses for book production, even after others had done so. In the longer term, however, this rejection probably did contribute to a decline in the level of their intellectual output relative to Europe, not least in the field of science and technology. It was not the only factor, and I do not want to fall into the conceptual trap of technological determinism in diagnosing the causes of the transfer of scientific leadership from Muslims to Europeans from the 16th century onwards. But there can, I think, be little doubt that printing did enable, even if it did not cause, the scientific revolution in Europe , and that the lack of it had a restraining effect on subsequent scientific development in the Muslim world. Figure 13: [Anonymus], Persa De siglis Arabum & Persarum astronomicis. Ed. John Greaves. London: M.Flesher, 1648. By the 18th century, both the ruling classes and some intellectuals in the leading Muslim power among Europe's neighbours, the Ottoman Empire, had become aware of this discrepancy, and took measures to rectify it by establishing a printing press of their own – the famous Müteferrika Press, which started in 1728. It is notable that prominent among the books which it produced were a number of illustrated scientific works, such as the Cihan-nüma, a cosmographical treatise by the famous Turkish polymath Kâtib Çelebi. Figure 14: John Bainbridge & John Greaves, Canicularia. Oxford: printed by Henry Hall, 1648, based on the astronomical tables of Ulugh Beg. The same was true, a century later, of the early output of the first Muslim press in Egypt, the Bulaq Press. Some of these, such as a treatise on modern physics and its apparatus, published in 1838 , were translations of European works, and in this case we see an interesting repeat of what had taken place a thousand or more years earlier, with outside knowledge entering the Muslim world through a translation into Arabic done by an Arab Christian. As in that earlier period, this was soon followed by original scientific research, which again began to take its rightful place in Muslim intellectual endeavour, after a long period of relative stagnation . This has continued through further communications revolutions in more recent times. If you search the Internet now for the latest scientific research contributions, you will find among their authors many Muslim names. Figure 15: Kâtib Çelebi, Kitâb-i Cihânnümâ, Istanbul: Ibrahim Müteferrika, 1732. Figure 16: [Perron, Nicolas.] Al-Azhar al-badi'a fi 'ilm al-tabi'a. Translated by Yuhanna 'Anturi. Bulaq, 1254 . I have been able to give here only a very cursory sketch of a factor in scientific history which is by no means as linear and straightforward as perhaps I have made it seem. But I hope I have at least drawn your attention to an important link between the world of the scientific intellect and its necessary material embodiment, which should not be ignored. E. g. Seyyed Hossein Nasr, "Oral Transmission and the Book in Islamic Education: The Spoken and the Written Word", The Book in the Islamic World: The Written Word and Communication in the Middle East, ed. George N. Atiyeh, Albany, 1995, pp. 57-70. Jonathan M. Bloom, Paper before Print: The History and Impact of Paper in the Islamic World, New Haven, 2001. See also FSTC, Knowledge, Learning Institutions and Libraries in Islam: Book Publishing and Paper Making. Bloom, Paper before Print, p. 104. Youssef Eche, Les bibliothe`ques arabes publiques et semi-publiques en Me´sopotamie, en Syrie et en Egypte au Moyen Age, Damascus, 1967.FSTC, Knowledge, Learning Institutions and Libraries in Islam: Book Publishing and Paper Making. Salah al-Din al-Munajjid, "Women's Roles in the Art of Arabic Calligraphy", The Book in the Islamic world: the Written Word and Communication in the Middle East, ed. George N. Atiyeh, Albany, 1995, pp.141-148; François Déroche and others, Islamic Codicology: An Introduction to the Study of Manuscripts in the Arabic Script, London 2005, pp. 191-192. David A. King, "Some Illustrations in Islamic Scientific Manuscripts and their Secrets ", The Book in the Islamic World: The Written Word and Communication in the Middle East, ed. George N. Atiyeh, Albany, 1995, pp. 149-177; Bloom, Paper before Print, pp. 125-135. See Geoffrey Roper, The Fate of Manuscripts in Iraq and Elsewhere. Thomas F. Carter: The Invention of Printing in China and its Spread Westward, 2nd ed., rev. L. Carrington Goodrich, New York 1955. See Geoffrey Roper, Muslim Printing Before Gutenberg and the references cited therein. Bloom, Paper before Print, pp. 203-226. See FSTC, Latinized Names of Muslim Scholars. The Republic of Letters and the Levant, ed. A. Hamilton, M.H. van den Boogert, B. Westerwell, Leiden 2005. Geoffrey Roper, "Early Arabic Printing in Europe. Arabischer Frühdruck in Europa", in Middle Eastern Languages and the Print Revolution: A Cross-Cultural Encounter = Sprachen des Nahen Ostens und die Druckrevolution: eine interkulturelle Begegnung. Ed.= Hrsg. E. Hanebutt-Benz, D. Glass, G. Roper, Gutenberg-Museum Mainz, Internationale Gutenberg-Gesellschaft. Westhofen 2002, pp. 129-150, 526-529. Elizabeth L. Eisenstein, The Printing Press as an Agent of Change: Communications and Cultural Transformations in Early Modern Europe, Cambridge 1979. Nicolas Perron, Al-Azhar al-badi‘afi ‘ilm al-tabi‘a, tr. Yuhanna ‘Anhuri, Bulaq 1254 . See, for instance, the examples described in Médecins et ingénieurs ottomans à l'âge des nationalismes, ed. M. Anastassiadou-Dumont, Paris & Istanbul 2003.